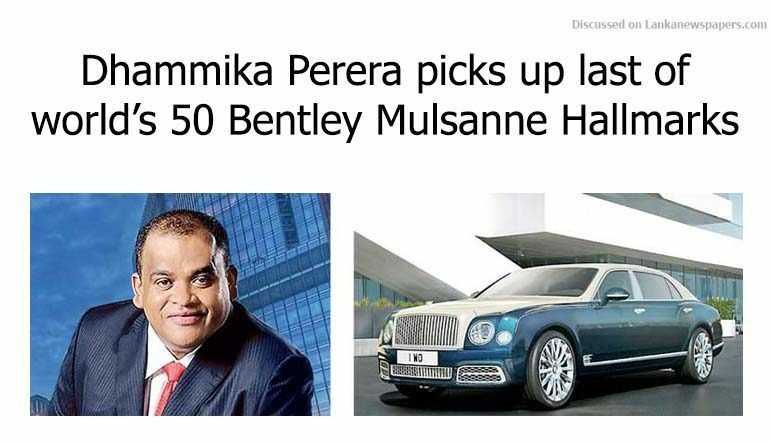 Dhammika Perera, as the richest business leader in Sri Lanka, has taken delivery of his prized – and perhaps the first in the South and Southeast Asia or the Middle East – Bentley Mulsanne Hallmark, worth around Rs. 160 million, inclusive of import duty. Apart from the West, there are only three such Mulsanne Hallmark Series units in Asia i.e. China. The catalogue price is Sterling Pounds 390,000 (around Rs. 84 million) and the duty on the dream machine is a staggering Rs. 76 million, according to Sri Lanka Custom sources. Created for visionaries with the power to turn their ideas into reality, the Bentley Mulsanne is the flagship model of the Bentley range. It is much more than a luxury sedan – a pure expression of phenomenal performance and the pinnacle of exquisite luxury. The world’s finest handmade car represents the ultimate combination of both luxury and performance. The car features exquisite design details from Mulliner – Bentley’s personal commissioning division. This includes: a Hallmarked silver or 23.9 carat-gold-plated ‘Flying B’ mascot, a matching fine line running the length of the body, silver or gold metallic hide lining the storage compartments, complementary painted veneer and a stunning precious metal veneer inlay. Exquisite in the extreme, the Mulsanne Hallmark Series represents a glittering addition to the Mulsanne range – and a collector’s item in waiting. According to the Bentley website, the famous retractable ‘Flying B’ mascot is engraved with ‘Commissioned’ on one side and ‘By Mulliner’ on the other, and is hewn either from solid silver (featuring the Bentley hallmark) or finished with carat-gold plating. Both models feature an exquisite hand painted fine line running the length of the coachwork, in either gold or silver. Single or duo-tone paint finishes are available with the Hallmark Series by Mulliner. Imposing 21” polished alloy wheels and the distinct Mulliner grille create the ultimate statement of luxury. Additionally, the beautifully intricate new ‘Serenity’ grille is also available as an option. Inside, the Mulsanne Hallmark Series by Mulliner features front and rear seats trimmed in contrasting hides, to create a bespoke colour split. Stunning silver or gold embroidery and piping complete the exclusive interior design. Unique metallic silver or gold hide lines the Hidden Delights storage spaces, inspired by the tailoring for the very best Savile Row suits. The hide on the seats and door panels has the delicate Mulliner quilting pattern, while the veneer is painted to perfectly match the secondary hide colour, creating a considered and elegant interior inspired by current interior design trends. The fascia has a silver or gold overlay with a ‘Mulliner’ inscription, and there are silver or gold-plated inlays on all door waistrails. Alcantara rear cushions matching the secondary hide, illuminated treadplates bearing the word ‘Hallmark’ and stainless steel plaques engraved with ‘1 of 50’ complete the truly extraordinary interior of the new limited edition Mulsanne Hallmark Series.